The best lemon olive oil is made by including lemon in with the olives when the olives are cold-pressed for their oil. Know that nothing one makes at home will quite live up to that standard, but most commercial lemon-infused olive oil s are not made that way, and instead are made more or less as described below, with a gentle heat-and-soak. Lemon-infused olive oil is obviously fabulous to use in a salad dressing but is also nice to have on hand to simply drizzle over grilled vegetables, chicken, or fish. It's also not bad for dabbing on fresh goat cheese or even using on plain while milk yogurt or lemon sorbet. Lemon-infused olive oil keeps, sealed and with minimal light exposure, for several weeks. Note: You may be tempted to leave the lemon zest in the oil, but the oil will keep longer if you remove it, and, plus, once the oil has cooled down, it's not going to take up more flavor from the zest. You can certainly infuse olive oil with other things, and the method is the same. Scrub the lemon clean (seriously, use soap and scrub it; the peel can take the attention, and since you're only using that outside zest, you want it completely clean) and dry it thoroughly. Use a very sharp paring knife or a vegetable peeler to remove the zest from the lemon in long strips. Unlike most calls for zest, you want big strips, not small gratings. The zest is just the bright yellow part of the peel, not the bitter white pith immediately below it. Whatever you do, leave the pith behind, it will turn the oil bitter; if bits of pith cling to the zest, use a sharp knife to carefully cut it off. Put the lemon zest and the olive oil in a small saucepan and warm it over medium heat. Do not allow the oil to simmer, or develop any bubbles, even little ones along the side of the pan. Keep the oil warm for about 10 minutes. Remove the pan from heat and let the oil cool to room temperature with the zest left in there to steep. Strain the lemon zest out of the oil: either pour it through a sieve or simply use tongs or a fork to lift the zest out of the oil, letting any excess oil drip off back into the pan. 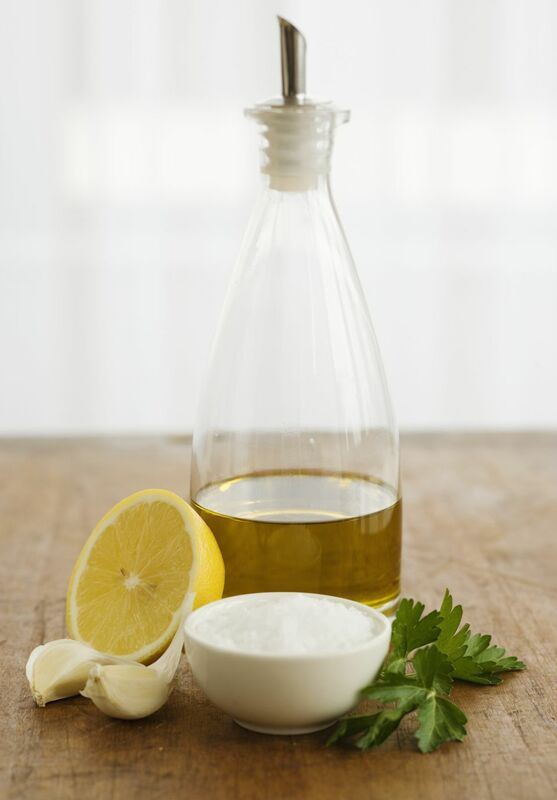 Transfer the now-lemon-infused oil into a clean jar or another type of sealable container. Store the oil in a cool, dark place.